"As I’ve been pretty lazy to carry my laptop around, but I like being in touch with my online contacts, I thought it might be a better idea to install a chat client in my mobile phone. Once only possible for people with smartphones and the likes, the availability of Java apps has made “normal” phones pretty smart. 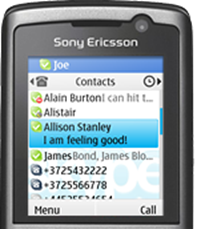 I’ve scoured the net for Java chat apps which work on my Sony Ericsson K750i (yes, I’m still using that) – it’s old but still does everything well. If the apps work on my phone, it’ll work better on your newer, fancier phone (but I can’t guarantee that, of course)..."